There are other slots play online is about Pirates, except these aren’t your usual pirates, they are birds, dressed as pirates. Climb the rope and hop on board this avian pirate ship and spin through 5 reels filled with pirate fruit, birds and grinning blueberries. There’s no sign of scurvy on this vessel, the only thing you’ll be catching is free spin bonuses. Playson pride themselves on their slot games’ uniqueness when it comes to themes, graphics and features. Nothing’s off limits and each slots experience is crafted so as to fit the players’ needs and preferences and leave their hearts, as well as their wallets satisfied. The enjoyment of their creations stands in simplicity and originality, and there’s every chance you’ll find a favourite among their portfolio. Lucky Pirates is not only about pirates, but surprisingly so, it is about fruit pirates that bring you prizes and laughs, so you’ll feel lucky to be playing it. Click here for the full range of Easy games. Join and play! 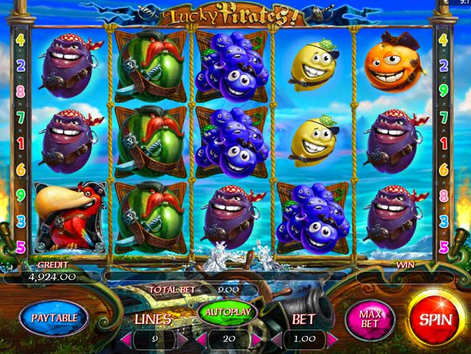 Pirate themes have been exploited many times in slot games uk, but never before have we seen pirates that are also fruits. Oranges, cherries, watermelons and lemons, they all have their own intimidating, smug or clumsy personality and the proper attire for a real pirate: eyepatches, guns, swords and even hand hooks. If you join this diverse crew on their quest to find treasures, you’ll end up not only richer, but also very amused by the whole experience. Being a pirate just turned from scary to fun in Lucky Pirates, and boredom definitely has no place on this ship. This slot game has 5 reels and 9 paylines that will impress you with their originality. The 3D graphics used to design the characters, as well as the background will charm you right away. Gaze upon the wild blue sea surrounding you while spinning the reels framed with rope, and enjoy the easy-going, relaxing and slightly silly music. These elements are sure to put you in a good mood, emphasized by each winning spin. Start placing your bets between 0.27 credits and the maximum of 45 credits. There might not be as much pirate action taking place in Lucky Pirates, but there’s a lot of fun to be had. The golden pirate coin symbol is the Wild Card of this game and it substituted any other symbol besides the Scatter, in order to form more winning combinations. The Scatter is represented by the pirate starfish and the reason why it has such a big smile on its face is because it can award you with up to 4500, if you spin 5 Scatters. The parrot symbol, however, is the most valuable, and it will reward you with up to 25000 coins, if you spin 3 or more of them. The rest of the crew is quite valuable as well: the blueberries and moustached watermelon award up to 2.500 coins, the plums and oranges award up to 1000 coins and finally, the cherries and lemons can bring you a prize of up to 500 coins. There is also a huge chance to win the massive jackpot of 5000x your initial bet, that comes when you cover the whole reel with Parrot symbols. Now that’s a helpful companion for any pirate! 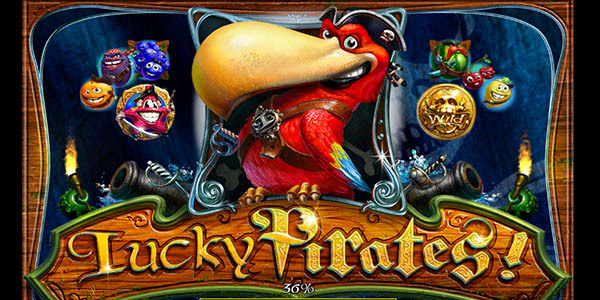 Lucky Pirates has one of the most unique themes developed by Playson. Even though there aren’t any Bonuses or Free Games, the high quality graphics, fun characters and the chance of winning the big jackpot should have you excited enough to try this slot game out. Our most popular slot is Starburst.